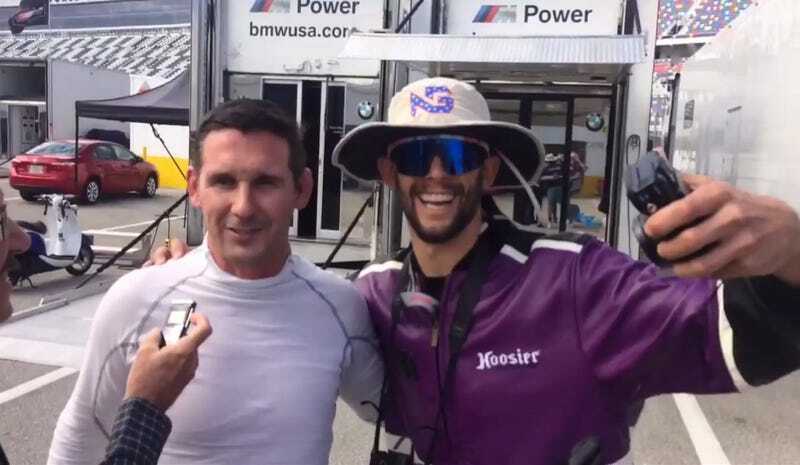 WeatherTech Sports Car Championship prototype driver and former bearer of the greatest mullet in motorsports Jordan Taylor showed up to a series test at Daytona disguised as a selfie-taking fan. Some of his fellow racers caught on to his shenanigans pretty fast, but others? Not so much! Andy Lally and Bill Auberlen seem to have mastered the minimal-effort photo-op. Ozz Negri recognizes Taylor pretty quickly. It takes Lawson Aschenbach a second, but he perhaps has the best “oh, it’s you” reaction of the bunch. Taylor named his persona “Rodney Sandstorm” and described him as a super fan. I’d say he nailed it, but maybe he would’ve been a little less obvious if he hadn’t worn the same sunglasses from his infamously silly IMSA credential photo. He’s got the “obstruct every cart in the paddock” schtick down solid, though. Anyone who’s ever been to a race weekend hopes they’re not that guy, but we know that guy is out there. We’ve seen him in action, blocking everything with no self-awareness that he’s in the middle of a busy path. Between the floppy hat, retro sunglasses, jorts and purple jacket, though, this may just be the disguise of the year.